Nureva Inc. has announced the implementation of its Span visual collaboration system at Macromedia University, one of Germany’s leading private universities for media, communications and design. The Span system has been installed in the design thinking lab at the university’s campus in Munich, and plans are underway to install a second system at its Berlin campus. The implementation of the Span system transformed a wall in the open-concept classroom into a 10' 2" (3.10 m) wide interactive workspace where students can share and discuss their ideas in a flexible and dynamic way during the design-thinking process. 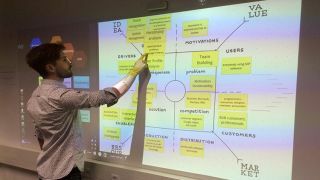 Macromedia University students have unique opportunities to get real-world business experience by using design thinking to help companies deal with the impact of digital technologies. Students have worked on research projects for some of the country’s top companies such as SAP, Bosch and BMW. The projects focus on discovering ways for organizations to adapt to new technologies and develop ideas for new products and services. University representatives stated that students used to rely on paper sticky notes to track their ideas and organize information during key stages of the design-thinking process. By bringing this process into the digital realm, it is easier for students to evolve ideas and see correlations between research data and other information. Multiple students can work together on the 200-foot (60.96 m) shared digital canvas from their personal devices or contribute and organize information directly at the wall. Students also use the system to present their research findings to client companies, turning what used to be a static conversation into a collaborative and interactive experience. For more information, visit www.nureva.com/span-system and http://www.mhmk-international.org.